Acetaminophen is a non-salicylate analgesic and antipyretic (pain killer and fever reducer). It is a common over-the-counter pain medication found in hundreds of products around the world. At higher doses it is known to cause liver-damage and has a low therapeutic index (ratio of effective dose to toxic dose), making it dangerous when included in recreationally used pharmaceuticals. It is not known to be psychoactive. People seeking psychoactive experiences from medications that also contain acetaminophen may be putting themselves at risk for liver damage. 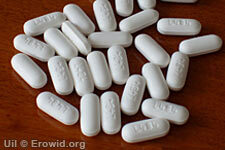 Ask Erowid: Can the liver heal from acetaminophen damage?